Here’s a few updates and photos of various businesses and projects around town in Ocean Beach. The OB Green Center has moved into Jim Bell’s building, and according to Kip Kruegar, will reopen by the end of this month – January. Bell’s building is directly across Voltaire from the store’s former location. There’s a bunch of interior dry-walling to be done, Kip said – and many boxes to be emptied and items to be re-organized in the front space of the one-story site. The ‘end-of-the-month’ seemed optimistic. The exterior – adorned with many signs and sayings – also appears to be needing some paint. Black tarps covering parts of the infamous Ebers and Greene building have been shredded and dislodged by the wind and are now exposing the interior to the elements – which is not easy on unprotected wood structures. This is all just a continuation of the deterioration of this 3-story structure that gained notoriety for various reasons over the last couple of years and which was the issue of a San Diego Reader cover story recently. The twin condos that are nearly-3-stories on Froude appear to have their exteriors nearing the completion point. Construction began in the Fall of 2017 and today they look ready to take their place as one of the most-out-of character residences in that part of … Point Loma. They literally sit across the street from the OB Community Planning boundary. How do today’s exteriors compare with the drawings submitted to the city and community? The Black Bead shop on Newport definitely appears to be closed up for good; we’d heard the long-time business was shutting down. It celebrated it’s 20th anniversary in 2013, so sadly it shut the doors on its 25th anniversary. 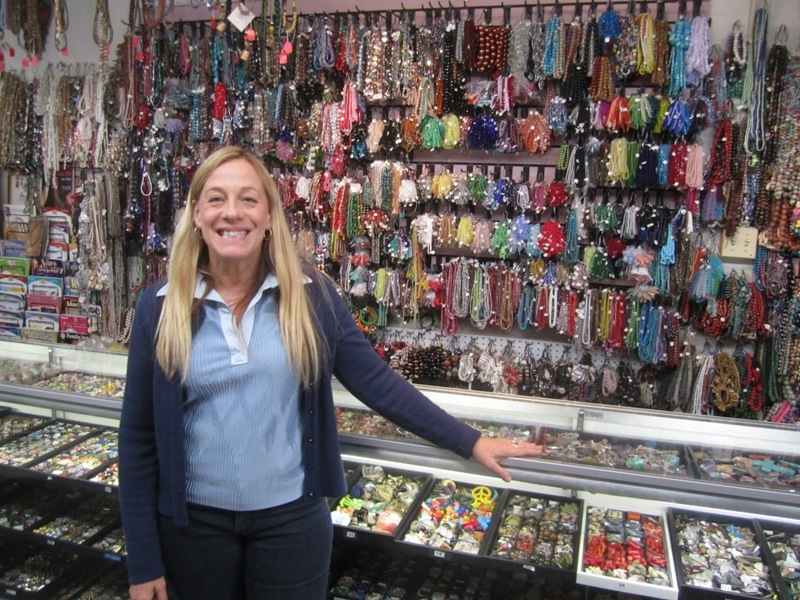 Lynn Muhlenkord owned the store, and with the help of her 3 employees had turned the place into a “must-shop” business if you are into beads of any kind, size, or shape. People from all over San Diego came here. The Black Bead broke away from The Black, next door, close to two and half decades ago, as it used to be a counter within the larger store. Some good news – the unofficial “mayor of OB”, Claudia Jack, will return to work in a couple of weeks, according to Denny Knox, the executive director of the OB Mainstreet Association – where Claudia works. Claudia has been out of circulation for several months due to health reasons. She was missed at the annual Christmas auction back in late November. She usually handles the sales of raffle tickets. Plus she runs the weekly Farmers Market – and OBMA staff member Tracy took up the slack this last while. We welcome her back. It’s too bad the City didn’t know Target was moving into OB on Newport Avenue. Otherwise it could have put off the repaving of OB’s main commercial street. It was just last February the city began the work on repairing and resurfacing Newport. For on Tuesday, the 8th of January this year, crews for Target punched 3 holes into Newport in order to install (or repair) utility lines for the mega-store, clearly disturbing the nice, new street surface. Meanwhile, the rehab of the old antique mall continues. One worker told this reporter he thought the mini-Target would open in 6 months. In a nice change to its front, the eatery Hummus has opened it up, allowing customers to enjoy the fresh air and do people watching while doing their hummus consuming. Now it can join the other restaurants on that strip of Newport in offering views with the food. Less than 2 weeks ago, a new women’s clothing and jewelry shop opened on the 4800 block of Newport, near the OB Hardware store. Called Shara – a family name, it has other shops in Long Beach and Seal Beach. Tera, the clerk on duty, had heard of the OB Rag and was excited to be part of the new enterprise. Mad Munch a Month Away? A worker inside Mad Munch Grilled Cheezer Co. told me he believed the cheese sandwich shop would open in one month. Near Stuff to Puff, the storefront has been empty for months, while the owners did their thing at the weekly Farmers Markets. Well, that’s it for our cruise around the village. Until next time. Wow that duplex on Froude looks even uglier than in the drawings. Looks like they went cheap and gave it the full stucco and cookie cutter sliding door treatment.